Uday Singh-NRI Uday Singh, a US Army trooper, had been killed in Iraq. NRI Uday Singh, a US Army trooper, had been killed in Iraq. 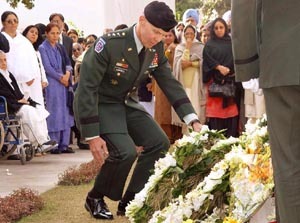 December11, 2003 The US army's Lieutenant General James Campbell led tributes to Sergeant Uday Singh as his body was cremated in his home.Lieutenant General Campbell, who heads the US army's Pacific Command, spoke of Sergeant Singh as a "brother in arms and a true Indian". Describing him as a hero, he said Sergeant Singh was and always would be an American soldier. For the first time ever, soldiers of the United States Army, mounted an honour guard for one of their fallen comrades in India. 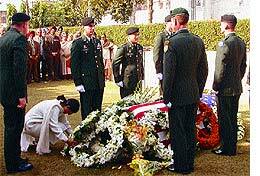 Six US Army pall bearers — three majors, two captains and a warrant officer — draped the coffin of Sergeant Uday Singh, with the US Stars and Stripes. No guns boomed in salute for the slain soldier. Only the last post sounded as the six American pallbearers stood at attention, mourning the young man who had died fighting their war. The Americans did not fire their guns — they could not in an alien land. The military honours were preceded by a religious ceremony, in which Sikh prayers were read out. The dead soldier's father, former Indian army officer Lieutenant Colonel Preet Mohinder Singh, his mother and his sister, wept as his body was consigned to the flames, according to ancient Sikh ritual. 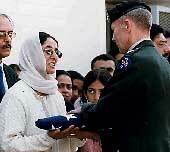 Uday Singh's parents were later given a US flag and replicas of their son's medal by Lieutenant General Campbell. 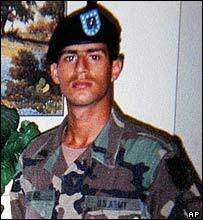 Sergeant Singh was killed on 1 December when his patrol was ambushed by suspected insurgents in the town of Habbaniya, west of Baghdad. Uday Singh went to St Stephen's School, Sector 45, about three years ago. After getting a Green Card, he joined the US Army and and was sent to Iraq. He had planned to work for two years in the army and then like to go fot higher studies. His father Lt Col Preet Mohinder Singh, who owns a service station in Sector 17 and was very close to his son Uday Singh. Uday used to tell his father not to worry about him. Uday has an 11-year-old sister, Bani, who is studying at Sanawar. His friends and family members remember him as a cheerful person, who was soft-spoken and respectful. He loved racing cars, war movies, was full of life and had a burning desire to join the US Army - a decision that finally took his life. Uday Singh had visited his parents for a few days in March, and just a few weeks ago, had written to them from Iraq, where he mentioned about an ear injury which had affected his hearing. A family friend recalled that he had also written to his grandmother recently. LAKE FOREST (Illinois) - A soldier from the Chicago suburb of Lake Forest was killed in Iraq when his unit was attacked while on patrol, the Department of Defense announced Tuesday. Army Spc. Uday Singh, 21, died Monday after an attack in Habbaniyah, Iraq, military officials said. He was assigned to C Company, 1st Battalion, 34th Armored Regiment, 1st Infantry Division of Fort Riley, Kan.
"His father told us he was on patrol when he was shot and died on the way to the hospital," said Singh's uncle, Prem Jay Datt, of Lake Forest. He said the Indian-born Singh's parents live in Chandigarh, India, a town near New Delhi. "We got a call from his dad at 7 a.m. (Tuesday) morning," Datt said. "My wife goes for her walk at 6 a.m. this morning and the moment she came back the phone rang. She picked it up and she knew right away it was the worse." Singh moved to Lake Forest in the summer of 1998 to live with his uncle and aunt and had planned to enroll in high school, Datt said. But he said his nephew changed his mind and returned home to finish high school before returning to the United States, where he enlisted in the Army in 2000. Singh came from a military family, his uncle said. He said the soldier's father served in the Indian army and his grandfather served in the British military when India was still under British rule. "He planned to save up enough money and go to college," Datt said. "He wanted to get a degree and do well in life." In the meantime, Singh was pursuing his U.S. citizenship. In fact, the Datts on Saturday received a letter from Singh saying that he planned to return to the U.S. to be sworn in as a citizen in January. "Then three days later, we get a call from his father," Datt said. "We could not believe it. ... Twenty-one years old and he's gone forever."